Former All-Star pitcher Sun Dong-yol, named new South Korean national baseball manager Monday, said he wants young players to represent the country with more pride. 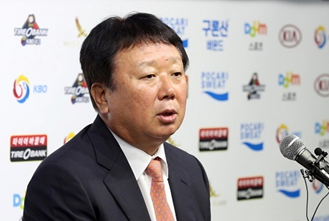 The Korea Baseball Organization appointed Sun, 54, as the first full-time national team manager. He will hold the reins through the 2020 Tokyo Summer Olympics, where baseball will make a return to the quadrennial competition after a 12-year absence. Sun will make his international managerial debut at the inaugural Asia Professional Baseball Challenge from Nov. 16 to 19 at the Tokyo Dome. The new event will feature players from South Korea, Japan and Chinese Taipei, and will be limited to players under 24 or to those with under three years of professional experience. Sun will also lead South Korea at the 2018 Asian Games, 2019 Premier 12. At his introductory press conference, Sun said his first and foremost goal is to "put together the best team possible" for upcoming competitions. As important as talent is, Sun said he also wants his players to come ready to represent the nation with a sense of pride and honor. "I'd like to emphasize the importance of pride in wearing the national flag on the chest," Sun said. "I think some young players today lack that kind of pride." Previously, the KBO had different national team managers for different competitions, mostly those who were already managing professional KBO clubs. At some offseason tournaments, those managers balked at getting the national team duties, saying they wanted to focus on their pro clubs instead. The KBO decided to name a full-time bench boss for the next three years, after Kim In-sik, a 70-year-old former KBO manager, announced his retirement from international play following the 2017 World Baseball Classic. South Korea was eliminated from the preliminary round at the WBC, with Sun as a pitching coach. And Sun partially attributed that disappointing performance to the players' lackadaisical attitude toward playing for the nation. "Some future events will be held before or during the professional season," he said. "And I hope the players selected to the national team will take care of their body with a sense of responsibility." As a full-time national team manager with no club responsibilities, Sun said he'll be able to travel across the nation to watch games at all levels -- KBO, or its minor circuit called Futures League, and even amateur baseball. And he'll have to scour leagues for talent, for the current dearth of quality starting pitching and young power bats could cause any manager headaches. Sun, former MVP-winning pitcher in the KBO, lamented a lack of a dominant starter who could go deep into games. But he added he'll have a chance to see the country's young talent firsthand at the Asia Professional Baseball Challenge. "I think once some of the young players showcase themselves and gain experience, they should thrive at the 2018 Asian Games or the 2020 Olympics," Sun said. "The team's ultimate goal is to win Olympic gold." For the Asia Professional Baseball Challenge, Sun could name up to three players over the age limit as "wild card" picks. He said he was pleased with the young talent pool among pitchers and position players, but he'd have to use his wild cards on catchers since he feels it's the weakest position in that age group. Since the 2019 Premier 12 champion will qualify for the Olympics, Sun said the national team members for that tournament will most likely stay on for the Olympics. And when assembling the roster for the Premier 12, the focus will be on Tokyo 2020. Though South Korea is in desperate need of a generational shift, Sun said he'd be willing to stick with veterans in their mid-30s as long as they perform. In particular, he made references to 35-year-old veterans such as St. Louis Cardinals reliever Oh Seung-hwan and ex-Seattle Mariners first baseman Lee Dae-ho, who's back playing for the KBO's Lotte Giants. Sun brings an impressive resume both as a player and a national team pitching coach. Sun is widely considered the greatest KBO pitcher ever. He won three MVP awards and posted a 1.20 ERA for his career in 1,647 innings while starring for the Haitai (now Kia) Tigers. He went 146-40 and also recorded 132 saves, racked up mostly during his second life as a closer. Sun pitched 11 seasons with the Tigers starting in 1985, before moving to Japan. From 1996 to 1999 with the Chunichi Dragons in the Nippon Professional Baseball, Sun collected 98 saves and had a 2.70 ERA. As a KBO manager, Sun led the Samsung Lions to back-to-back championships in 2005 and 2006, and to a runner-up finish in 2010. The Lions reached the playoffs in five out of six seasons on Sun's watch. Sun's last KBO managing job came with the Tigers in 2014.